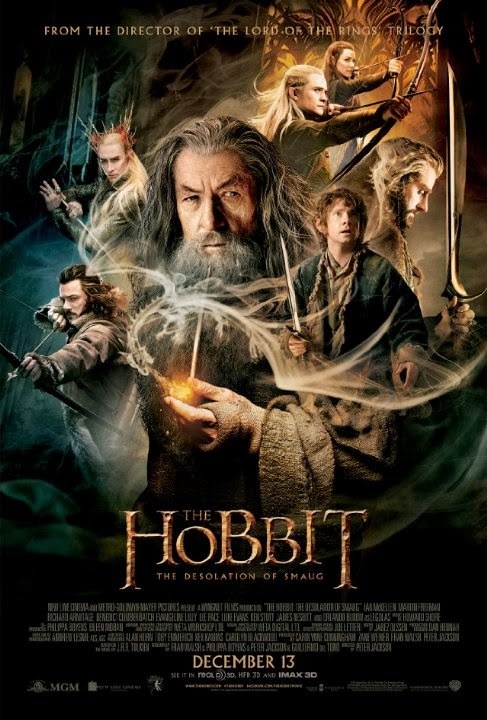 Peter Jackson partially redeemed himself with the second of his three-part Hobbit adaptations: The Desolation of Smaug. (I say ‘partially’ because I think the franchise is exhausted.) Part I was quite dull–mostly a rehash of the ending of The Return of the King grafted onto the finding of a magic ring, and the gathering of an odd band of 13 dwarves, a wizard, and a hobbit–all intent on recovering a treasure. Part II is much better, in part because some of the characters that merely populated Part I have started to develop personalities. Thorin Oakenshield (Richard Armitage) emerges with the proper mix of arrogance and leadership that befits the heir presumptive to the dwarf kingdom. The aged Balin (Ken Scott) has become the collective memory of that kingdom in the time of Thorin’s grandfather, who lost it to the fire-breathing dragon Smaug; and Kili (Aidan Turner) is flirtatious, with an ability to charm one moment and con the next. Kili, in fact, is vaguely elfin, which makes him a perfect foil (and perhaps attraction) for an exciting new character, Tauriel (Evangeline Lilly), a superb huntress and fighter who may or may not be too impulsive for her own wellbeing. Tolkien purists have bemoaned the creation of Tauriel, who was not in the book. I find it hard to argue for the ‘purity’ of a fantasy that began life as a children’s story, hence I applaud the energy she brings to Part II. Tauriel also points to some problems with the entire decision to make The Hobbit into a trilogy. It was a children’s book after all, and a relatively short one (310 pages). Part I of the film adaptation was 169 minutes long and Part II checks in at 161, which means that Jackson and his screenplay writers must do a lot of padding. They also have to divert our attention from the fact that characters from The Lord of the Rings ‘sequel’ that ended ten years earlier look noticeably older in the prequel, including Gandalf and elves (who are allegedly immortal) such as Lord Elrond (Hugo Weaving) and Legolas (Orlando Bloom). The story is also padded by adding endless action sequences. These are well done but, in all honesty, Jackson has already done just about everything that he could do with Middle-earth battles. He now resorts to sequences best described as a blend of Kung-fu and slapstick movies. You begin to wonder why any prince of evil would resort to an army as inept as orcs and goblins. They have become the equivalent of the red shirts that are the phaser fodder of the Star Trek franchise–in this case sword, arrow, knife, and axe fodder. Two elves seem to be capable of polishing off hundreds of orcs and can show off while doing so. Still, The Desolation of Smaug works because elves still enchant and the new setting of Lakeland unveils a new world to us. It’s a kleptocracy run by a greedy but goofy Master (Stephen Fry) in which smuggling and other underground enterprises flourish. The set is fabulous and looks like something Terry Gilliam might have imagined–a kind of a floating late medieval village infused with Dickensian gloom. Our key Lakeland character, Bard the Bowman (Luke Evans) is tight-lipped and enigmatic, which means we know he’s important, but the part’s so well written that his role isn’t telegraphed. If we’re honest, Part II also works because the monsters remain creepy extensions of our Jungian collective unconscious. The Mirkwood spiders prey upon primal fears of arachnids and Smaug is all the more terrifying because Jackson literally gave him a voice, ominously rendered by Benedict Cumberbatch.